Nutrition is a vital part of your complete health picture. Your body heals itself through its natural abilities but has certain requirements to maintain this capability. If you have inadequate nutrition, toxicity from food or the environment, your body’s healing potential will be limited. To get better, lifestyle changes are necessary. The nutrition and detoxification programs designed by Dr. Birchler are a remarkably effective and complementary addition to your chiropractic care at The Chiropractic Health Center. 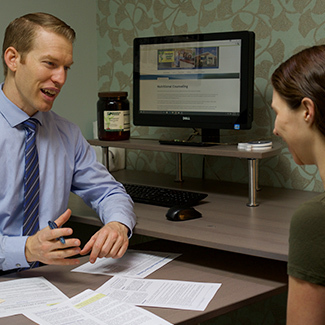 To begin, you’ll sit down with Dr. Birchler to discuss your health history. We’ll ask for a detailed body system and symptom survey to understand the symptoms you’re experiencing. From these details, we’ll gain knowledge about which areas of the body, such as organs or hormones, may be out of balance or weakened. Then, we’ll provide an individualized herbal or vitamin supplement plan designed around your needs. Dr. Birchler also offers one-on-one counseling for those who are interested, teaching you the foundational principles of health that can benefit you and your family. We can also use specific organ or system cleanses and detoxification techniques to bring your well-being to another level. We’ll discuss techniques such as intermittent fasting as appropriate. The recommendations Dr. Birchler makes to you usually involve Standard Process® and Dr. Morse’s Cellular Botanicals nutritional productions. Standard Process is a well-established company with an outstanding reputation. Their whole food-based products are from concentrated sources that are mostly grown on their certified-organic acreage. Dr. Morse’s Cellular Botanicals was founded by Dr. Birchler’s mentor, Dr. Robert Morse, who often works with cancer, spinal cord injury patients, and other serious conditions. These herbal formulations can be of great assistance to those who are ill.
Want to Start Making Changes Now? If you’re looking for some ways to improve your nutrition, Dr. Birchler advises his patients to eat more raw, living foods the way that the Earth provides them and the way our Creator put them there. Rather than any particular diet, we believe that life comes from life. If you want to be well, living nutrients will maximize your inherent healing abilities. Each class is 1.5-2 hours long with small and medium-sized groups. Contact us today to find out when our next event is being held or to sign up!